A beautifully landscaped yard can truly help entice prospective buyers to take a better look at your home. If you’re getting ready to sell your home, you’ve probably done a lot to get it ready to be shown off to potential buyers. Cleaning floors, putting on fresh coats of paint and washing the windows all help make your home look more appealing, but what about your yard? A yard can be a huge selling point for some homes, so make sure your’s looks its best before you show by hiring JFK Lawn and Landscape’s residential landscape services. A professional landscaping service can help you decide how to make the most out of your yard and all of the aspects that make it unique. Having new plants or trees professionally planted will help make sure they are a good fit for your yard and the land conditions. Weeding will help keep flower beds and lawns healthy, and mulching will make it harder for weeds to return while improving soil conditions. Turf enhancement will help make your lawn look lush and green. Aeration will help maintain your current yard by improving the soil and allowing for nutrients and water to more easily reach the roots of your grass. As grass roots get older, they take longer to produce new blades of grass. In order to replace the old grass roots, you should have professional overseeding done once a year, usually in late summer or early fall. If you can’t wait for new grass to grow, sod installation is the best option. New sod takes just a few weeks to take hold and immediately looks great. Once your lawn in looking good it’s going to take some work to keep it that way. Mowing, leaf removal, and hedge and tree trimming all help bring out the best in your lawn. 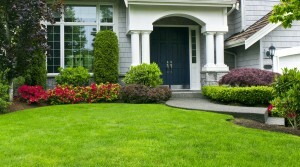 Let the professionals keep your lawn looking good so you can focus on getting that house ready for the market. Choose JFK for Planting a Garden in Maryland! While you’re here, don’t forget to follow us on our new and growing Facebook, Twitter,Google+, and LinkedIn pages to stay up to date on our blog and the latest landscaping news, tips, and tricks! This entry was posted on Tuesday, June 28th, 2016 at 9:28 am. Both comments and pings are currently closed.